Broadway Sessions is a new live performance opportunity for artists in Adelaide, South Australia, created to help foster talent and provide a regular space for artists to perfect their craft. More specifically, Broadway Sessions aims to be an inclusive and easily accessible opportunity for performers, of all backgrounds and ages, to sing something out of the musical theatre genre. It isn’t just any old open mic night though: not only do performers have a stage to sing from, but the talented Broadway Sessions band is there to accompany the artist for a true broadway feel! 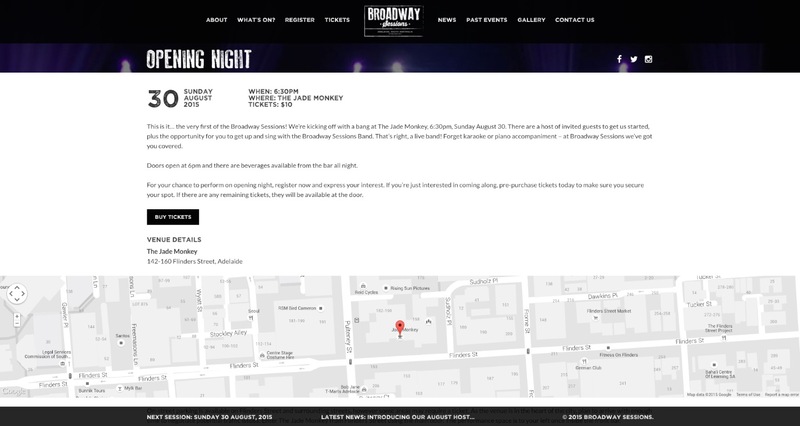 Because of the different nature of the event, and the need to communicate lots of information in a visually appealing manner, the site and brand for Broadway Sessions had to be new and modern, easy to use and navigate, but visually impressive (all at the same time). Scott Reynolds is also a producer of this event, and as result was able to take complete control over the design and development of this project. 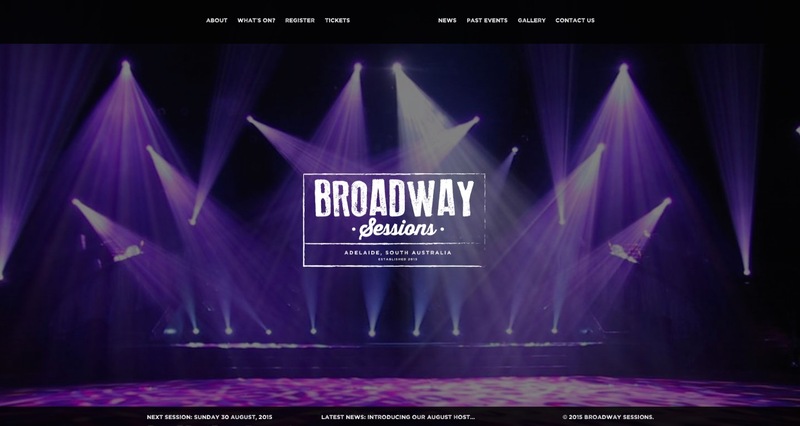 The site was built using the popular WordPress content management system (CMS), and this has enabled the entire Broadway Sessions team to update the site independently without the need for a web developer to be on hand. Much of the main functionality is part of the standard WordPress CMS platform, but a considerable amount of custom work was required to accommodate the event and registration system required on the site. This included utilising custom post types for Session items, performer information, news items and venue information. The site was built to allow events to be created, using information from pre-populated fields (where possible), and the display certain information based on the current date and time. An automatic system, such as this, means that someone does not have to be on hand to disable or enable registrations, for example, as the appropriate deadlines arrive and pass. Using the standard WordPress admin section, custom management areas were created to allow for easier organisation and creation this additional content. 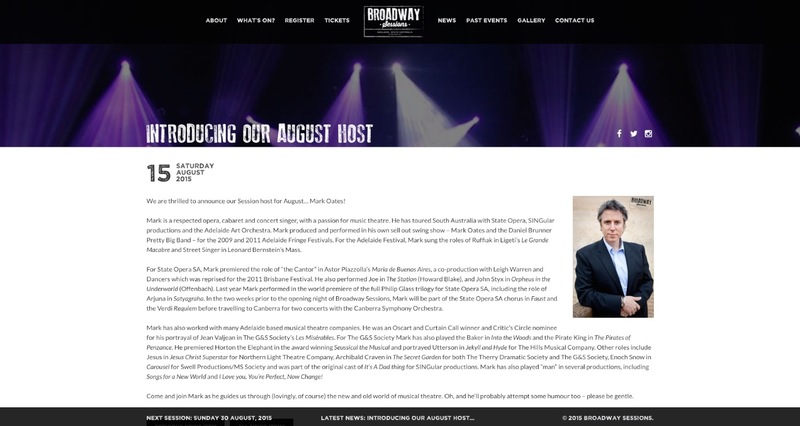 As a result, the Broadway Sessions team is able to take charge of both the look and feel of the site, along with all the information contained within, without needing to resort to code changes. This allows for more a much more dynamic site to be presented – crucial in this kind of environment where visitors are only interested in up-to-the-minute information. While the site was complete at launch, there are still features to be enabled publicly such as social media feeds and media gallery areas. As the event is new and no photos or videos were available at launch, the decision was made to complete this work ahead of time and simply enable these functions when the time came. 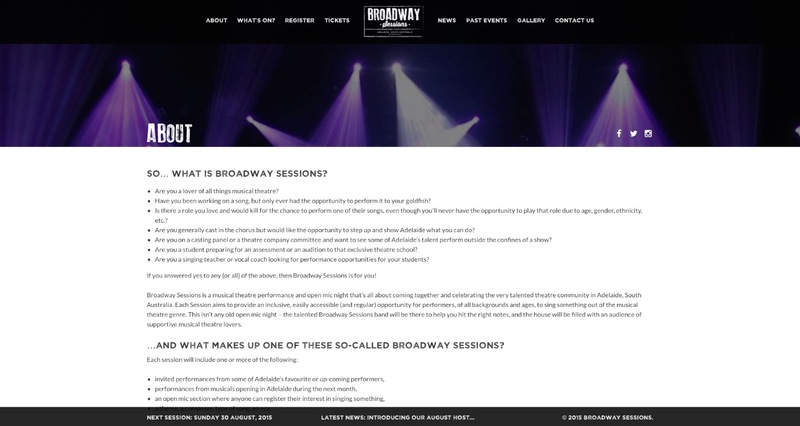 The Broadway Sessions website is connected to Google Analytics to enable the team to better identify trends and assist with improving the flow of the site as it matures and grows. Having this data easily available is crucial as it means that decisions can be made and supported by the evidence available – rather than simply by gut-feel. As always, additional SEO work will be completed behind the scenes, however even at the initial launch of the site performance is well above expectations. The site has now seen the first period of registrations and ticket bookings, and although minor improvements have been tabled to improve the workflow, it performed flawlessly in providing these options to visitors.